One of the perks of working in animation is that you can find other people who like to paint. 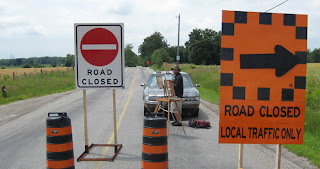 Myself and a few friends at the studio go out during lunch for a little plein air painting. The time limit forces us to work quickly, and small. 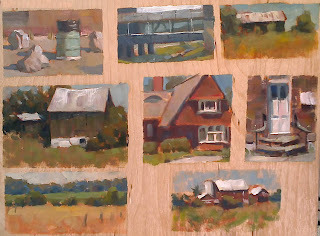 This is a collection of lunch sketches painted directly on an unprimed piece of birch board. They are about 20 minutes each, and feel more like aerobic exercises than paintings. 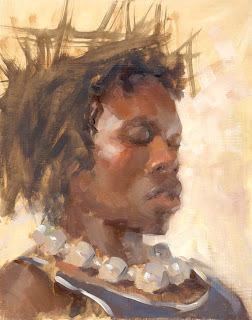 Oil sketch from last week. These days I'm working on increasing both speed and accuracy. Unfortunately, I can't take credit for the design of this thing. 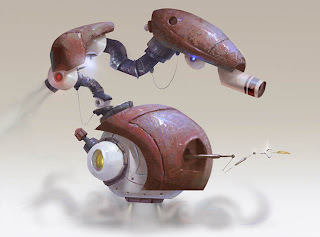 It was drawn (quite effortlessly) by the design supervisor at work, and my friend, Elena Panova. I liked the shapes so much, I had to ask her if I could paint it. She said no, but I painted it anyway. 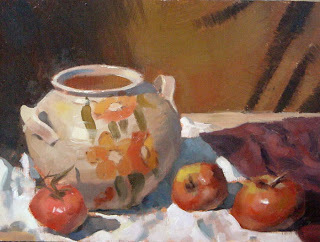 Never thought I'd ever be interested in setting up a still life with a vase and fruit. I found this cool vase at a gift shop last week and bought it for 20 bucks just so I could paint it...and it was actually pretty fun! 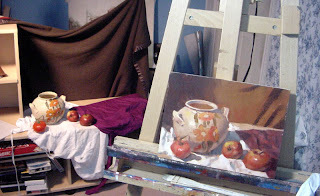 I will definitely do more still life painting. 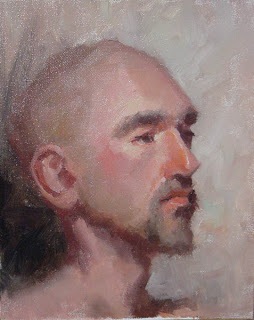 And the bottom image is last week's alla prima head study. Some conceptual work is coming soon, I promise!